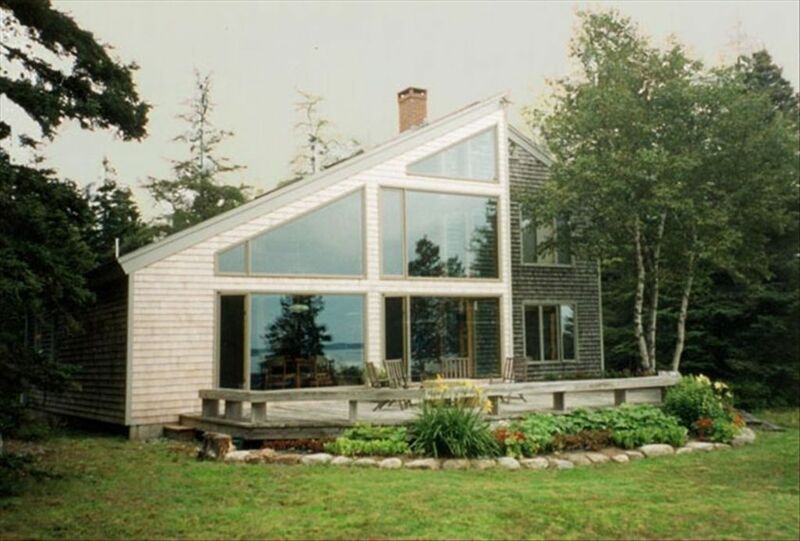 This is a stunning house with beautiful views of the Deer Isle Thoroughfare. The main living area is a true great room with fireplace, game table, dining area and a very well appointed kitchen. The master bedroom with queen-size bed, is on the first floor and looks out toward the ocean and also toward a quiet cove. On the second floor are two more bedroom, one with a queen size bed and the other with twin beds. Each upstairs bedroom has a small loft. At the top of the stairs and overlooking the great room is a loft with desk and fax machine. It is a great spot to work with your computer. A large deck faces the water and a path leads to our fabulous lobster picnic rock, The Giant's Chair, on the shore. You can swim from our rocks or walk to a little beach next door. The house will accommodate six very comfortably. If you wish to sleep more than that, we will need to discuss it. Smoking and Animals are NOT Permitted, but well-behaved children and adults are always welcome. You will find the kitchen set up for people who enjoy cooking. There are plenty of work areas and professional pots and pans. The library is well stocked with books on the area, children's books, mysteries, and the best of the books which my book group has read over the past couple of years. There are plenty of puzzles and games. We are a family that enjoys music and games like charades and dictionary, so you will find a good stereo, but you will not find a TV. This is a place for a true vacation! The house is located on a very private piece of land. The beautiful fishing village of Stonington is within walking distance but you are not subjected to the traffic and noise. There are fine restaurants on the island, and we keep a list of our favorites handy for you. The mail boat leaves right from Stonington for day hiking in Acadia Park on Isle Haut. The island has several good nature preserves with hiking trails. There are also tennis courts and a nine hole golf course on the island. For those interested in the arts, Haystack School of Crafts and many galleries are close by. This is a great place for nature lovers. There are paths on the property, and the Giant's Chair, a huge rock on the shore, is a great place for an outdoor lobster feast. Regardless of what you are escaping from, we are sure you will find this home a relaxing place to spend your vacation. If you would like to see additional pictures, I can email some to you. Maine is in our blood as Judith's family descends from early island residents. This property is a dream for anyone who loves sailing, watching boats, or observing marine life along a rugged coast. For many years we had a boat moored in the cove off the house. While no longer active sailors, we can watch the windjammers go by, observe osprey and their young as they fledge, and visit the local art galleries. This is Maine at its best. Judith is an avid gardener and always plants vegetables and herbs for our tenants to enjoy as well as flowers. We believe in sharing the bounty of the land. 2 bathrooms each with tub/shower combination. Grab bars in first floor bath. Second floor has an extra sink in the alcove off the bathroom. living room has a heat exchanger for heat in cooler months and air conditioning if very hot. Air conditioning is generally not needed with nice breezes on the coast. New heat exchanger added in the living room in 2015 for more energy efficient heating. We have a small children's table for little ones to play or eat at and there is a booster seat should you need one. A good selection of children's books and adult books are on the shelves. I bring up many of the best books my book group has read during the year. Lots of board games, jigsaw puzzles, badminton and other games are in the house. I plant a vegetable garden each year and plant enough for tenants as well as our family when we are there. A truly unique vacation hideaway surrounded by natural beauty. Our party of five (ages 5 - 70) had a great time and hope to return again someday. The owner was very responsive to any question we had. The property description and photos are very accurate with a modern, spacious kitchen as well. The town of Stonington is small but is drop-dead gorgeous. It is not some fake tourist town, but rather; a real working village of people engaged in the lobster industry. The area is a daytripper's delight. Around every bend in the road is a new cove with views even more pretty than the ones before. Visits to Acadia National Park and Bar Harbor are well worth considering. Mail boat rides to different islands, lighthouse tours, and Lobster trap tours all leave from Stonington docks. The lobster boat tour was our favorite activity and our five year old granddaughter loved every minute of the adventure! Our favorite restaurant was Aragosta, a tiny but elegant jewel, right on Main Street. This is a a very special home in a very special place that disarms you with its beauty and elegance. That all made for a very special vacation. We are hapoy that you enjoyed your time in Stonington. We like sharing the home we love with people who enjoy nature and the special beauty of the Maine coast. Please come back. Heaven and Nature sing along the shore!! Looking for privacy and unending Penobscot views? Or access to lobsterman and their fresh catch or a well equipped kitchen and your very own vegetable garden? Or an owner who personally communicates and tends to details? This is THAT place! Easy access to grocery, sand beach, farmer's markets and the best lobster roll around. Plenty of opportunities for hiking, kayaking and day tripping. We were drawn to the area for the landscape and all things quintessentially Maine. And after several trips to Stonington now, we have fallen in love with the art and artists and the artisans behind 44 North Coffee, wood fired Tinder Hearth Bakery and Aragosta. This was a great situation for our family and our curious 2 year old and we so appreciate the owners sharing this gem with us. This is what the coast of Maine should look like! First, the property owner maintained excellent communications. All questions were answered promptly. Second, located on the secluded land, the house was extremely beautiful and private. The property was well maintained. As cooks, we found the kitchen was fully equipped and ready for cooking. It was conveniently located for shopping as it was half way between Burnt Cove Market and downtown Stonington. It was also within a walking distance form the beautiful sand beach and was on a private rocky beach. The photographs were true the their nature. Third, Stonington itself had variety of restaurants and it was not overrun with tourists, and the Stonington Opera House had a variety of programs. All and all, the two months we spent in the house were everything we expected. As a perspective renter who is touring the property said "This is what the coast of Maine should look like". What a treat to stay in a rented property and have no unpleasant surprises. If only all VRBO would follow the McMillan example, renting wouldn't be the nightmare it so often is. We enjoyed a week in this beautiful location and could not have wished for more. This very special home was accurately described in the listing both as to location and amenities. The owners are available to answer questions and strive to maintain the property in excellent condition. Anyone who enjoys the quiet and surroundings of the Maine coast would consider themselves fortunate to spend time here. Rates are subject to change until confirmed. A security/rental reservation deposit is required.